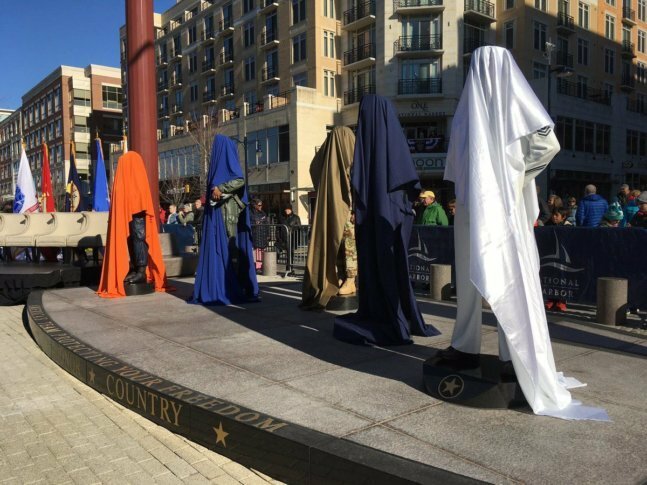 A big reveal at National Harbor honors those who served in the U.S. armed forces: statues representing the five U.S. military branches— Army, Marine Corps, Navy, Air Force, and Coast Guard. WASHINGTON — This Veterans Day marked 100 years since the end of World War I.
Peterson says the statues were two years in the making, from idea to unveiling. He also says painstaking care was taken to make sure the uniform details match real-life specifications—from hat sizes to name tapes. Several coats of paint were used to cover the figures. “It’s airplane paint. You’ve got 14 coats on it because it’s got to stand out here in the elements,” Peterson said. The pieces were created by Brooklyn-based artist Ivan Schwartz [http://www.studioeis.com/about/ivan-schwartz/].